Does Archetype of Endurance trump Lightning Greaves? If I have a creature protected by Aegis Angel, and I use End Hostilities does it die? 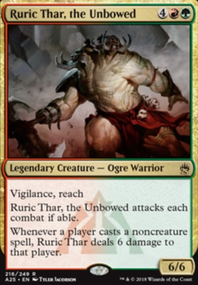 Can Uril, The Miststalker loose its hexproof ability? TypicalTimmy on "That's no island...."
Once he becomes a creature, spot removal is really seriously going to set you back. If someone kills / bounces / exiles him, it's going to take casting him plus five more spells to turn him into a creature again. 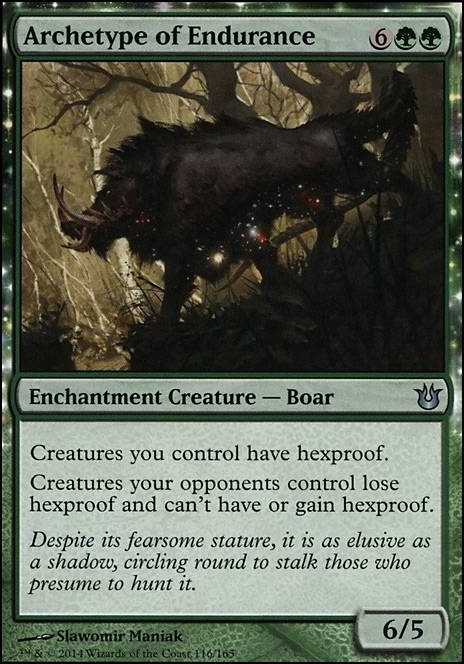 Because of this, you may want to consider some Hexproof. There is also Archetype of Endurance and Asceticism if you'd like, but the rest keep the curve down. Archetype of Endurance just seems too expensive to me. 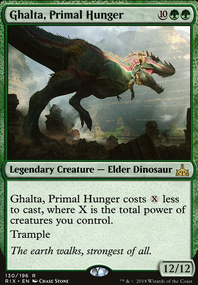 I can already spend half the mana for hexproof just by playing Shalai, Voice of Plenty . The fact that it makes my opponents lose hexproof is nice but situational. For more hexproof, what about an Archetype of Endurance maybe? Griselbrand is, in 95+% of situations, the reanimator target of choice. His text box may as well read "when this enters the battlefield, you win the game", as he draws you a ludicrous number of cards on command, restocking your hand and graveyard. Plus, you know, 7/7 flying lifelink. 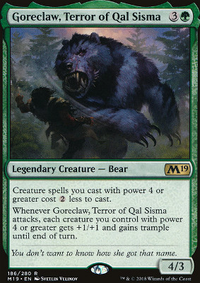 If you don't want Gris or he's out of your budget range, Jin-Gitaxias, Core Augur can sort of imitate him, although not nearly as well. I don't think you need blue mana? All your actual spells get cast off only, and you're surely not planning to hard cast any of the fatties. 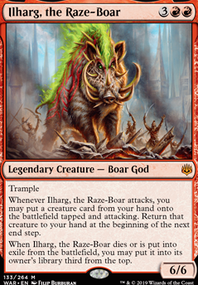 For self-discard options, Faithless Looting is amazing, if you're willing to splash a little red into your deck (maybe instead of blue). Entomb is super good at immediately dumping a fatty into your graveyard. If you don't want to pay for that, the next best bet is Buried Alive . Dark Ritual is a good speed improvement in certain hands. Swamp -> Dark Ritual -> Entomb -> Exhume -> Griselbrand basically wins the game on turn 1. As many copies of Reanimate , Exhume , and/or Animate Dead as you want to pay for would be good. Redundancy is key to getting your fatty reanimated consistently and in decent time. To protect yourself a bit from countermagic or similar, Duress is great. Ideally you probably want Thoughtseize , but that's expensive. Your Lili planeswalker and Elixirs probably aren't needed. If you're playing casually, reanimator might not be a good deck choice, as it creates a lot of "nongames" where the games are just won or lost based on how fast your opener is / how much graveyard hate or early interaction exists in your playgroup. Partita straordinariamente veloce. Oloro apparecchia con un po' di mestizie tipo Meekstone e Pendrell Mists . La partita quindi rallenta subito finché non entra Jodah che spara Sunbird's Invocation e, il turno dopo, Conflux . 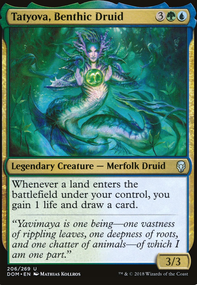 Tutora Avacyn, Angel of Hope , Omniscience , Kaervek the Merciless , Progenitus e Archetype of Endurance . Scende Omniscence senza che nessuno abbia risposte e la sinergia con l'invocazione gli fa giocare a suon di cast e cascade letteralmente tutto il mazzo tranne le terre. Si sente il bisogno di qualcosa che dà rapidità perché Jodah passa e, prima che il turno gli torni, Oloro spara un Cyclonic Rift overloaded che gli rimanda in mano 50 carte. Le terre però sono ancora lì e sono sufficienti ad appoggiare Omniscence e, di conseguenza, tutto il resto. E questa volta il tavolo non ha risposte.